Yogurt can be a quick and nutritious snack (or even a meal) if you are trying to eat a healthy diet. But if you are counting carbs, the carbohydrate count in different types of yogurt can vary substantially. There are some important things you need to know to choose the right yogurt for a low carb diet. Yogurt can be a confusing food item when you're on a low-carb diet because you can't simply assume what the carb count will be. You have to read the label of every container and pay attention to the serving size listed. For example, deciphering carbs in plain yogurt can be confusing. You might think plain yogurt would have the same amount of carbohydrate as the milk it was made from, but this isn't always true. You have to check the label to see how many carbs each product contains. Understanding lactose in yogurt and knowing why the carbohydrate content varies for yogurt can help you avoid know what to look for when choosing a low-carb yogurt. Lactose is a sugar—specifically a disaccharide made of glucose and galactose—and it is the primary sugar found in milk, particularly in whey. Whey is the liquid part of the yogurt. Depending on the type of yogurt, lactose from whey may be the primary source of carbohydrates in yogurt. Yogurt is produced by taking milk and adding a culture of friendly bacteria that converts some or all of the carb-containing milk sugar—lactose—into lactic acid. Lactic acid is not a carbohydrate. Certain types of yogurt (such as Greek yogurt) strain out more of the whey. Therefore they contain less carbohydrate because there is less lactose present. If you don't want to buy commercially produced Greek yogurt, it is easy to strain much of the whey out of yogurt yourself. To strain the whey out of yogurt yourself, put a coffee filter in a strainer or colander and put that over a bowl in the refrigerator. It will become thicker and thicker as time goes on, so you can stop when it is the consistency you want. Eventually, it can reach the thickness of soft cream cheese, often called yogurt cheese. This can be eaten any way you like or mixed with other ingredients for foods such as dips. Another advantage to straining yogurt is that the concentrated yogurt has more protein per cup, as well as less carbohydrate. Production methods and ingredients vary between types of yogurt and yogurt brands. As a result, carb counts may vary as well. 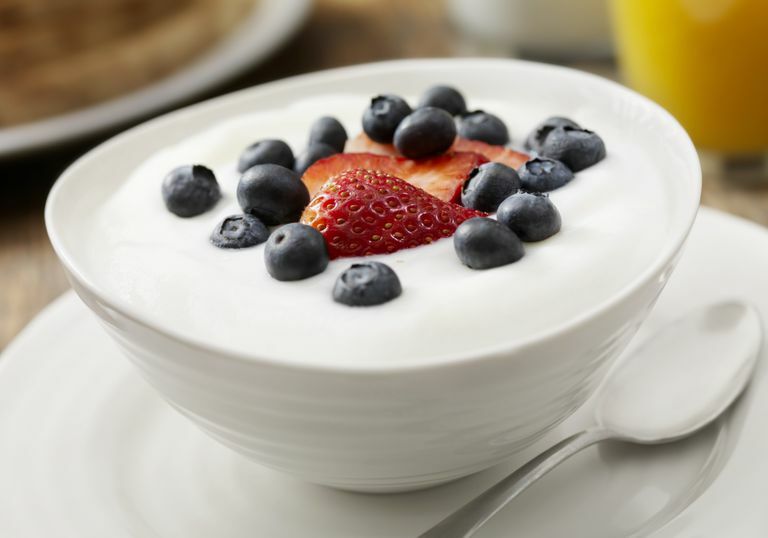 It's helpful to understand why these factors play a role in the final carb counts for yogurt. The friendly bacterial culture that turns milk into yogurt digest much of the lactose in milk. This reduces the sugar in the product. Dr. Jack Goldberg, the co-author of "The Four Corners Diet," tested fermented milk products. He found that up to 8 grams of carbohydrate are consumed by the bacteria in one cup of yogurt that contains live cultures. Under ideal circumstances, this would reduce the 12 grams of carbohydrate in a cup of milk to about 4 grams of carbohydrate in the yogurt made from it. However, in commercially produced yogurt, the fermentation process may be stopped before it reaches that low level. As a result, most yogurt has more than 4 grams of carbohydrate per 6-ounce serving. All yogurts are made with live cultures. But, in many cases, the cultures are killed so the fermentation stops in the final packaged product. After the bacteria are killed, the carbohydrate level becomes stable. Most commercial yogurt does not ferment long enough at warm temperatures for the maximum amount of lactose consumption by the bacteria. Although the process continues slowly after chilling, the vast majority happens in the stage where the yogurt is kept warm. If you are looking for a low-carb yogurt, choose one that has had the benefit of longer fermentation. Look for labels that confirm that the yogurt still "contains" live cultures, with the names of at least two kinds of bacteria, such as Streptococcus thermophilus, Lactobacillus acidophilus, L.bifidus, or L.casei. If a yogurt contains live cultures, the amount of carbohydrate will continue to slowly diminish, even after purchase. By the time the carbohydrate decreases to about 4 to 5 grams per cup, the amount stabilizes because so much lactic acid has been produced that the bacteria go dormant. If you make your own yogurt, it may take as long as 20 hours to get to this point, depending upon temperature. The yogurt you buy may have ingredients added during processing that affect the carbohydrate count. For example, plain yogurt often has added ingredients that increase carbs. Nonfat milk powder is often added to thicken nonfat plain yogurt. Powdered milk contains the milk sugar known as lactose. Therefore it adds back carbs that the original probiotic bacteria digested while turning milk into yogurt. Whole milk plain yogurt is naturally thicker, so it is less likely to be thickened with powdered milk or other carb-containing thickeners than low-fat or nonfat yogurt. If you are looking for a low-carb yogurt, it should be your first choice when you are making your selection. Even after you take production methods and whey concentration into account, there may be differences in the carb count of yogurt simply based on variety. Consider some of these types of yogurt and why the carb counts might vary. Many of the most popular yogurts are flavored and there are fruit-flavored yogurts often made with berries or other sweet fruit like peaches. You'll also see vanilla-flavored yogurt, coffee-flavored yogurt, caramel yogurt, and honey-flavored yogurt among others. Each of these flavored yogurts will be higher in sugar and higher in carbs—even if they claim to be "all natural" or "naturally flavored." Fruit contains sugar (fructose) so even if there is no sugar added, the fruit provides additional carbohydrate. In addition, many of these flavored yogurts increase sweetness by adding more sugar. The actual carb counts for flavored yogurt varies widely, but flavored Greek yogurt may contain 14 to 20 grams of sugar. And traditional low-fat flavored yogurt may contain twice that. Frozen yogurt is delicious because it is very sweet. The sweetness (usually) comes from added sugar. Even fruit-flavored frozen yogurt generally has substantial sugar added to it. A single serving of soft-serve frozen yogurt may contain 35 grams of carbohydrate or more. A single serving is considered to be one cup. If you add fruit or other toppings, the carb count will increase. Frozen yogurt bars are also higher in carbohydrate, although because these products are portion-controlled they may be a smarter choice. There are non-dairy yogurt alternatives made from coconut milk which are different than coconut flavored dairy yogurt. Non-dairy coconut yogurt is sold in some stores and you can also make it at home. Depending on how it is prepared, coconut milk yogurt may have fewer carbs than traditional or Greek yogurt (with some brands around 10 grams of carbs per serving). But if you add any flavors or toppings, the carb count will most likely increase. With all of the various production considerations and varieties taken into account, it can be confusing choosing the best low-carb yogurt. Usually, the best choice is a whole milk Greek yogurt that is unflavored. It is less likely to be thickened with milk powder or other carbohydrate additives than nonfat or low-fat plain yogurt. If you can find one with live cultures, you may be able to reduce the carb count further. Avoid low-fat and nonfat yogurts as they often contain more carbohydrates. If you don't enjoy the taste of plain yogurt, it may be a struggle for you to keep yogurt in your diet when you are going low-carb. But there are ways to enhance the flavor and keep it in your meal plan. First, use your own flavorings so you know how many carbs you are adding to the yogurt. Add small portions of low-carb fruit and blend. Or top your yogurt with heart-healthy chia seeds, walnuts, or almonds. You can also blend yogurt into green smoothies to give a veggie-based drink a delicious creaminess. Remember, when you are making low-carb choices, you will need to pay close attention to the nutrition labels on prepared foods such as yogurt. Find the one that matches your goals and enjoy the benefits of this dairy product. Goldberg J, OMara K, Becker G. The Four Corners Diet: The Healthy Low-Carb Way of Eating for a Lifetime. New York: Marlowe; 2009. National Yogurt Association. Live and Active Culture (LAC) Yogurt FAQ's. USDA. National Nutrient Database for Standard Reference Release 28. Can You Still Drink Beer on a Low-Carb Diet?